Epoxy plays many roles in boatbuilding. It’s glue, filler, and encapsulator. This versatile material is just short of miraculous in what it can offer to make strong watertight joints. Jim Stumpf dons the sacrificial epoxy jacket to show how to work with it right. 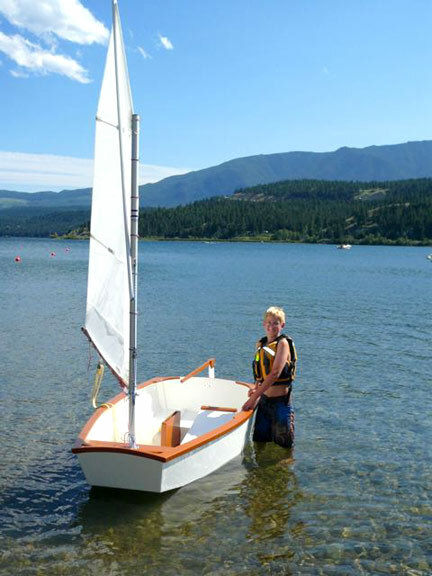 Jim, a long time CABBS boatbuilder who has completed many boats – including a 24 footer – stated that epoxy has a hazardous side. In contact with skin, epoxy molecules can be absorbed into the body and create a rash reaction. So to use this material, you need to use it smart. That means always wearing disposable gloves when working with epoxy and when sanding it, always use a respirator. Jim also recommended wearing a shop coat to cover your clothing. You are going to get epoxy on you no matter how careful you are. Having a sacrificial shop coat can prevent ruining a shirt or pair of pants every time you work with epoxy. Epoxy is a mixture of a resin and a hardener. Different epoxy manufacturers have different mix ratios. Some are as simple as one to one, others require five parts of resin for one part of hardener. Typically it is measured out by volume. An easier method is to use calibrated hand pumps similar to those used in ballpark ketchup dispensers. These can be ordered from the epoxy manufacturer. The pumps will be set so one downstroke of resin mixed with one downstroke of hardener will provide the proper ratio. The resin and hardener have to be stirred together to thoroughly mix the two and begin the chemical reaction to harden the liquid mix. The time available to work with the mix in a viscous form varies with the room temperature and the type of hardener. Some manufacturers offer variable hardeners to slow or accelerate the cure. The time available for use before the epoxy mix thickens is called open time or pot life. The epoxy is said to ‘kick’ when it begins to congeal. The epoxy mix gives off heat as the chemical reaction accelerates. Epoxy can be applied with inexpensive disposable brushes such as an acid brush or chip brush, each readily available at a hardware or home center store. It can also be applied with a paint roller fitted with a foam cover. Typically both surfaces of the joint are brushed with epoxy. The pieces are then clamped to prevent movement while the epoxy dries. Since epoxy has gap filling properties, it is not necessary to apply excessive clamp pressure. Some squeeze out is good and indicates good contact. Too much pressure however can cause too little glue to remain in the joint and cause glue starvation and a weak bond. It is important to work clean. As soon as the epoxy starts to harden (some use the term flash-off to indicate this state) you can use a metal putty knife to clean up all excess drips and globs. It is much easier to lift it now rather than to sand it later. Once the epoxy dries, usually within 24 hours, it can be sanded. Better yet, it is easier to use a cabinet scraper to more quickly smooth the surface. A heat gun can also be used to soften epoxy and scrape it away. Be careful not to heat the joint and weaken the set epoxy. Cleaning up is easy. Acetone is good for cleaning tools but it is flammable and not healthy for your skin. Common supermarket white vinegar works very well as a clean up solvent and is much better for your body. Clean carefully. You don’t want to rub diluted epoxy into your skin. If you wore gloves and used long-sleeves you shouldn’t have a lot to clean. When epoxy dries it leaves a film on the surface known as an amine blush. The film must be washed off with water before recoating with a layer of epoxy or paint. Not cleaning off the blush will result in poor bonding of the layers and possibly paint drying issues. Epoxy is commonly used to make fillets, a rounded fill of thinkened epoxy at the joint of two panels. To make a fillet, the epoxy mix is prepared as usual. Once it is mixed, wood flour (extremely finely prepared saw dust), silica, cabosil, or other materials are added to thicken it. Wood floor will produce a sandable fillet, silica will produce a stronger fillet but will be very difficult to sand. Consult your building plans for recommended thickeners. Begin by coating the area to receive the fillet with unthickened epoxy. Add thickener until the mix is the consistency of peanut butter. Use a tongue depressor or a narrow putty knife ground into a semi-circular shape to spread the thickened epoxy pressing it firmly into place. Careful work will mean less sanding later. Once the epoxy starts to harden carefully scrape off any excess left behind on the panels. Stitch and glue construction involves using epoxy with fiberglass tape and fillets to create a strong joint between two panels. Begin by coating the joint area with un-thickened epoxy. Then thicken the epoxy and form a fillet to fill the panel joint. Carefully center the fiberglass tape or cloth along the fillet. Use a chip brush to gently push the fiberglass into the coating and the fillet. Use more un-thickened epoxy to fully saturate the fiberglass. There should be no white blobby areas. These blobs indicate areas that need more epoxy. Careful smoothing of the epoxy will mean less sanding later and produce an attractive seam. A hull sheathed in fiberglass set in epoxy presents the water with a seamless, water tight surface. Plywood panels gain strength by sheathing in fiberglass cloth set in epoxy. To sheath a hull, the fiberglass cloth is draped over the boat. Where seams are necessary, the cloth sections should overlap each other. The epoxy is mixed and squeegees are used to quickly spread the epoxy on to the fiberglass and laminate it to the wood. Foam rollers of various sizes can be used to evenly spread the epoxy and create a uniform layer. Saturate the cloth so no white spots or dry areas are visible. A large amount of epoxy in a small container can get quite warm, even hot, and rapidly decrease its pot life. It is better to use a container with a large surface such as a paint tray to hold the epoxy. Spreading the surface area of the epoxy keeps it cooler and extends its open time. Fiberglass cloth becomes amazingly pliable once saturated with epoxy. Smoothing it with a large squeegee or brush can make it conform to curves without puckers or pleats. Work careful so later sanding is minimized. One coat of epoxy will bond the fiberglass to the wood but will not fill the weave of the cloth. Additional epoxy layers are necessary. The easiest approach is to add layers before the epoxy fully dries, usually less than 24 hours between each layer. If the epoxy fully dries, the amine blush must be washed off before an additional coat can be applied. Epoxy has enabled the creation of stronger, lighter, and more durable boats. It is a standard material of modern construction. It is not without its hazards but thoughtfulness, gloves, sleeves and neat working methods can go a long to making its use a pleasant experience.